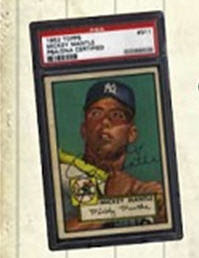 I held this card in my hand last year at the National Sports Collector's Convention in Cleveland, OH. Shortly after it's authentication and grading by PSA/DNA, I met with Brian Gray to discuss the planned release of this one-per pack product that will include a chase for the highest grade ever given to a Mantle signature. This product is going to make TriStar's Hidden Treasures look like a bad joke. Final production figures and pricing have not yet been released but I anticipate this product creating quite a buzz as it includes dozens of high profile autograph cards. For a complete gallery and further details, click here.